Hello mythical creature stealer lovers! I am Silver Wolf, president of the Gretchen Grimlock Enthusiast (Fan) Club! Also known as the GGEC or GGFC. Ask us in the comments if you would like to join. This page is about Gretchen Grimlock’s very own enthusiast club (which is this), and Gretchen Grimlock! About Us! – This will include our motto, logo, and club members. Gretchen Galore – This will have all the posters that have been released for Gretchen, or any other artwork. General Gretchen Gear – This is just the general information about Gretchen! Our motto – Greedy is Great when you’re talkin’ ’bout Gretchen! Greedy is great when you’re talkin’ ’bout Gretchen! Our members: If you only want to be a member, comment saying “I want to be a member,” or something like that. 🙂 If you want a higher rank then just Member, tell me why you’re a big fan of GG, how much of a fan you are (If she is your 1st 2nd or 3rd favorite villain. ), anything you know about GG that isn’t already on the page, and how many islands you’ve completed. Note: This is fan art. The actual winner was Binary Bard. Gretchen made it to the 2nd round in the Villain Showdown. 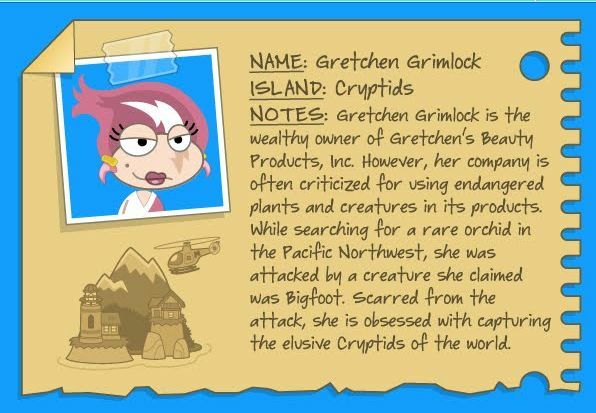 Gretchen Grimlock’s island has their own website. She is the 3rd female villain that is seen on Super Villain Island. The scar on her face was caused by a Bigfoot-like creature, which is when she started to try to capture mythical creatures. You actually only see her twice on Cryptids. There will be more soon! And BTW, the computer’s name is Holmes, right? oh yea, and i want to be in the fan club. I already have a membership. I think Binary Bard might have some sort of backstory that explains a bit of it, not sure. I can understand why she’d want Big Foot, if someone gave me a scar and I ran a makeup company….you wouldn’t get away with it. hey, i think i saw you in a common room once….. O.o I DID!!!!!!!!!! Can I join? She is my second fave. only after Zeus. I like Zeus best becuse he appears in two islands. I was sorta expecting that when I saw him in Super Villian Island. Sent from Silver Wolf on Poptropica!!! Oh Gretchen! How I wish I had your cute outfit! Can i join more than one club? Of course! The maximum is 4. Did you do the pictures? Does anybody have a catch-phrase/motto for the club?? That is actually really good! Yay, thanks! 😀 It just popped in my mind. I’m going to enter one more but which one? Binary Bard or Captain Crawfish? Okie. I mean, the plants are pretty famous villains. You could also include the monster plants at the end. You can do any villain that is still playable against. What about Director D? He is my 4th favorite and I’m really sad I can’t join his club, if he ever gets one. You could join his club! We can’t really prevent people from joining their favorite villains’ clubs, so go ahead and join if someone makea one for him. I like Director D, I honestly didn’t think he’d be the villain. I’d join that club. Why do you feel bad?! No. Don’t feel bad. It’s not your fault. *sigh* I know. It’s no one’s really. 😦 Just makes me sad…. @CS – Why do you feel bad? @SW – Okay, great! 😀 So the new maximum is 4? Oh and can I start the Director D. Club, even though I already started Black Widow’s club? Yeppers, and yeppers (Unless someone else wants to start it.). I wanna join the computer off of Game Show if someone starts it. 😆 Maybe I should look for a bigger villain. 1. It won’t hurt there feelings too bad. Don’t you remember the villain showdown of 2011? How do you think they felt then? 2. No offense to the PTFP, but they probably don’t read this blog. 3. There are THOUSANDS of Poptropica players, and the ones who are joining these clubs, aren’t that many, so I don’t think it will matter. @ SD – I have answered your question. 😐 It’s just how I feel. IDK…. For NF, you can start a page for her and watch her work on it herself. 😛 You don’t have to join the club NF makes. 1. I think I stumbled upon that sometime before…. 😆 I couldn’t think of any other sort of villain that related to chocolate! The burglar? No, not really. What is your favorite villain the nobody has picked yet? Ooh! There’s a club for her? Sweet! Okay, a member or Vice P? Vice P if that’s okay. The ones in ‘our member’? Sure! GG is probably my 1st favourite villain so far. I probably find her my favourite because she’s one of the few female villains and she seems like a huge fan of pink (my old favourite colour). GG is also one of the first villains who shows herself right off the bat (most villains are revealed near the end). I also like her because she picks the right time to strike, right when you find Big Foot at the end. Also I’ve completed 26 islands. Okie. Here comes another Sidekick (Vice P.)! Congrats! I was going to ask to be Vice P., but that’s already taken. I guess I just want to be a member. 😦 Or maybe Co. Vice President? Thanks! Would you like to join? What position other then a member? 3rd in command? I’m making this different: A vice president adds things to the page… Therefore, there can be more than one.